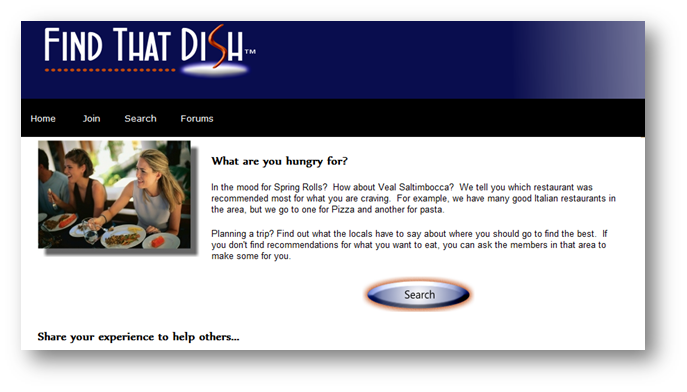 Find That Dish is a community based site which is intended to connect people with particular dishes served in restaurants in the area of the United States requested by the searcher. This service is generally provided by the community of users by either responding to a search request made by another user or by making a recommendation of their favorite restaurant serving a particular dish. In addition, restaurants may post information on a particular dish or an entire menu though this is considered an advertisement and is thus treated differently by the site. (From 2001) Just as we moved from snail mail, to the telegraph, to the telephone, so has Internet based communication evolved. From transferring data only the computer could understand, to e-mail, to the World Wide Web, and now eSpeech; it is the next logical step in Internet based communication. The Internet was built to provide a medium for free exchange of information and we keep that spirit alive by providing voice communication without any fees; no matter where or when you are calling. (Today) Pictured here as the first plug-in for Novell's Instant Messenger, the solution was more efficient and had lower latency than hardware solutions, and in many ways, was ahead of its time. True enterprise deployment with automated network setup, the solution was one step to functional and even adjusted automatically to any changes in the network. With NAT traversal, multi-subnet network support, and the ability to monitor and configure VoIP hardware based on Active Directory information, eSpeech was a administrator's dream.